Butter and seafood are two of sweetcorn’s classic partners. Here all three are wrapped together with punchy – and particularly British – spicing. 1. In a medium bowl, beat together the butter, lemon zest and juice, spices, salt and a grinding of black pepper. Fold through the crab meat until combined. Transfer the mixture to a large piece of baking parchment and roll up into a rough sausage shape; chill for about 30 minutes, until firm. 2. Heat a griddle pan until hot. 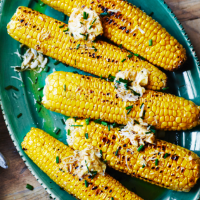 Rub the corn cobs lightly with olive oil and griddle for 2-3 minutes on each side, until tender and charred with dark spots; they’ll need 12-15 minutes in total. Top the hot cobs with slices of the crab butter and sprinkle with the chives before serving.